The Smithsonian Institution in Washington, D.C., is adding protest artwork and signage to its permanent collection. Emily Bland, one of the artist-protesters, said the Smithsonian’s decision to conserve Ferguson protest art could cement the protests’ importance in the public eye. “It was really exciting because I think it gave everything that we’re been working toward a little bit more legitimacy,” said Emily Bland, 26. Emily Bland on her initial reaction to hearing the Smithsonian Institution would include her banner in their permanent collection. Bland's work is a banner that featured prominently in the Ferguson October protests. The sign was black with white lettering that read “When injustice becomes law, resistance becomes a duty.” The dialogue between the Smithsonian and people involved with protests began weeks ago. Darian Wigfall was put in touch with a Smithsonian representative through his friend Cheeraz Gormon. Wigfall, who produced two signs to be included in the Smithsonian’s collection, traded multiple emails with a Smithsonian representative before receiving a formal acquisition letter from the institution. Wigfall said his reaction to the letter was instant. Both Wigfall and Bland are pleased to have their work included in the Smithsonian. The news surprised Bland. Both Wigfall and Bland stressed the importance of this step for people who participated in the protests since the August shooting death of Michael Brown by former Ferguson police officer Darren Wilson. Wigfall said this moment highlights the work of many ordinary people voicing their opinions. Wigfall’s sign took roughly 10 minutes to make with house-hold items while Bland’s piece was painted on a drop cloth. Wigfall said the signs helped protesters tell a narrative when it was impossible for everyone to access news outlets. Darian Wigfall shares the experience of working with the Smithsonian for their acquisition of two protest signs. 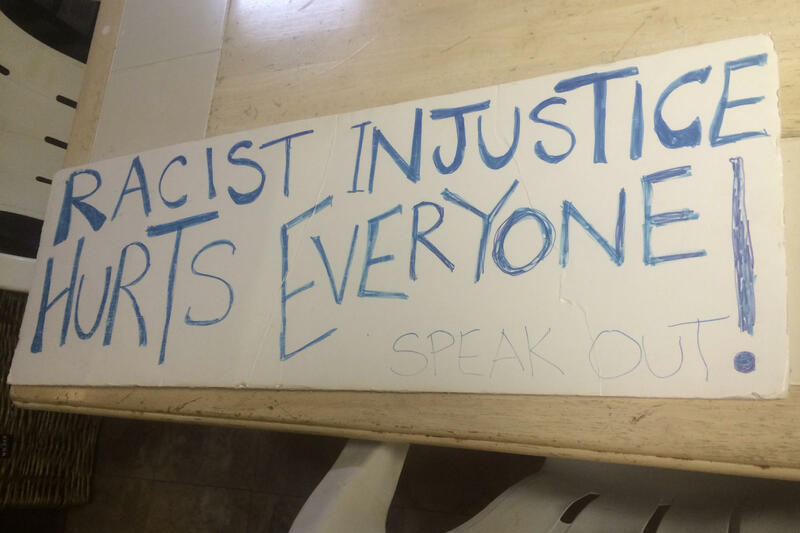 “The role those signs and banners played was that all of us couldn’t speak to a news outlet, but for all us to all have signs that said something similar kind of reiterated the message over and over,” said Wigfall. 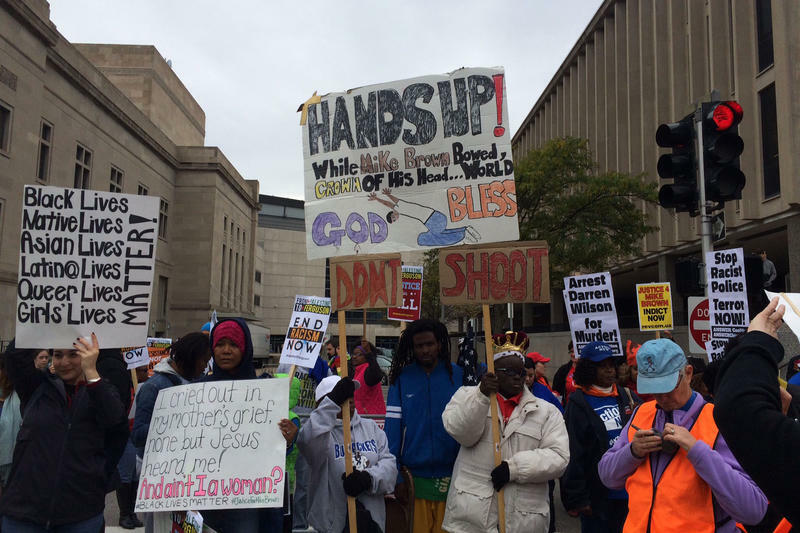 More than five other protesters will have work included in the Smithsonian Institution. For the first time in more than 20 years, the Spirit of St. Louis, Charles Lindbergh’s beloved single-engine plane that carried him to fame and the $25,000 Orteig Prize in 1927, is back on the ground — sort of. The iconic piece of aviation history is now sitting on the floor in the main lobby of the Smithsonian’s National Air and Space Museum in Washington, D.C. Smithsonian experts will examine every inch of the plane, assess its condition, review and document previous repairs and address the continuing toll time takes on historic artifacts. Amid pouring rains and a tornado watch, the fourth day of a national call to action in St. Louis included protests and dozens of arrests in Ferguson and elsewhere. The events Monday included a march led by clergy to the Ferguson Police Department, a "dead-in" at Washington University in St. Louis and a demonstration at St. Louis City Hall. Two Ferguson activists have received an award for their writing in the wake of Michael Brown’s August death. DeRay McKesson and Johnetta Elzie won the 2015 Howard Zinn Freedom to Write Award.